Karol Wojtyla appears on the balcony overlooking St. Peter's Square after being elected pope. (CNN) -- The next pope will be chosen in a well-defined traditional process that has been developed over centuries but one that the late Pope John Paul II also put his own stamp on. The pope can be elected by one of three methods but the most common method, however, is election by ballot. When the pope dies, the dean of the Sacred College of Cardinals notifies the cardinals and calls a meeting -- always held in the morning -- that must begin no more than 20 days after the pope's death. However, the cardinals already in Rome must wait 15 days for those who are absent to travel to the Vatican. Once at the Vatican, the cardinals must remain there and cannot communicate with anyone outside the area where the election is taking place. The maximum number of cardinal electors cannot exceed 120. By law, the conclave begins in the Sistine Chapel. On that morning, the cardinals will celebrate the Votive Mass, "Pro Eligendo Papa." That afternoon, the cardinals begin the election process. Blank ballots are then prepared and distributed. The ballots are rectangular in shape and must bear in the upper half, in print if possible, the words "Eligo in Summum Pontificem," meaning "I elect as supreme pontiff." The electors write the name of the candidate on the lower half and fold it in two. After writing the name of one man on his ballot, each of the active cardinals -- those under 80 years of age -- walks to an altar in order of seniority and pledges to perform his duty with integrity. Each cardinal then places a folded ballot containing his choice onto a small disc made of precious metal and drop it inside a chalice. After all votes are cast, the tellers tally the ballots and the result is read to the cardinals. If a cardinal receives two-thirds plus one of the votes, he is the new pontiff. After the votes are counted each time, the ballots are burned. If there has been no winner, a chemical is mixed with the ballots to produce black smoke when they are burned. Sight of the black smoke emerging from the roof of the Vatican Palace tells those waiting in St. Peter's Square that a pope has not yet been selected. When a winner has been selected, the ballots are burned alone, and the white smoke indicates there is a new pope. 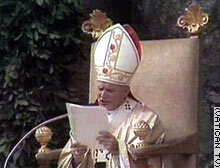 John Paul II gives his inauguration speech. If a pope is not elected after three days, voting is suspended for a maximum of one day to pause for prayer, informal discussion among the voters, and a brief spiritual exhortation from the senior cardinal in the Order of Deacons. Pope John Paul II instituted this change from previous elections in 1996. Voting is then resumed but after seven ballots, if a pope has not been elected, there is another pause. Another series of seven ballots is then held and, if there has still been no election, this is followed by a further pause for prayer, discussion and an exhortation by the senior cardinal. Voting is then resumed and, unless the election occurs, it is to continue for seven ballots. Traditionally, the winner had to garner two-thirds of the vote plus one, but John Paul II changed that as well in 1996. He ruled that if, after 12 or 13 days there is still no winner, the conclave could invoke a rule -- by majority vote -- that would permit the selection of the pope by an absolute majority. If there is a stalemate, this change would ostensibly allow a block of cardinals to stick together and elect a candidate in the event the majority vote was invoked. Once there is a winner, the pope-elect is asked if he accepts the decision. (Pope John Paul II reportedly accepted his election with tears in his eyes.) If he does, the dean asks what name he chooses and announces it to the cardinals, who then come forward to offer congratulations. The oldest cardinal then steps out on a balcony overlooking St. Peter's Square and says to the crowd, "Habemus papam" -- "We have a pope." He then introduces the pope, who steps out on the balcony to bless Rome and the world. 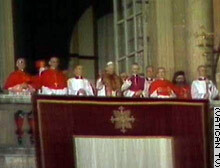 Many popes have been formally installed with a coronation, but Pope John Paul II refused a coronation and was installed as the pope during a Mass in St. Peter's Square. The other less common methods are by a unanimous voice vote or the unanimous selection by the cardinals of a 9- to 15-member committee, which then must agree on a pope. But neither of these is likely to happen when the cardinals gather to vote on John Paull II's successor. Over the centuries, there have been a number of methods for choosing a pope over the centuries since St. Linus, the second pope, replaced the apostle Peter -- St. Peter to Catholics -- in the year 67. Local clergymen who lived near Rome chose the first popes, but kings, emperors and other interested bystanders have done what they could to influence the process as well. And there were times when those who were displeased with the outcome appointed their own man, who was known as the antipope. But in 1059 Pope Nicholas II decreed that henceforth all papal electors must be cardinals, and in 1179 Pope Alexander III ruled that all cardinals would have an equal vote in the election. In 1274, Pope Gregory X decided that the cardinals must meet within 10 days of a pope's death, and that they should be kept in strict seclusion until a pope was chosen. By the late 1500s, most of the electoral procedures now used were in place.